This is a complete hand blown Venetian stemware service made by Salviati, circa 1920s. 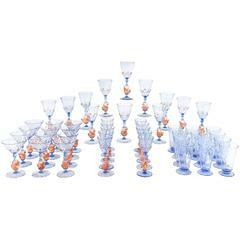 The 36 piece set consists of 12 each of water goblets, wine goblets and champagne coupes, each one featuring a figural golden yellow swan connector and applied rigaree. The color is a soft purple/amethyst with gold leaf inclusions which works nicely with a pastel palette. 12 water goblets measuring, 3.25" diameter x 5.75" tall 12 wine goblets, 3.38" diameter x 8.38" tall 12 champagne/martini coupes, 4" diameter x 6.5" tall. 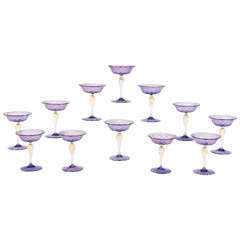 Six exquisite amethyst and gold infused Murano swan water goblets by Salviati Each piece is hand blown with applied gold balls and figural swan stems. The base has a 3" diameter. Set of 12 Salviati Venetian wines glasses Gold-leaf inclusion. Applied prunts.